Often the tasks can be complicated. To forget about anything you can use checklist in the kanban card. After entering the text, press enter and a new element of the checklist will be created. However, the editor will not be closed and you can enter the next element. 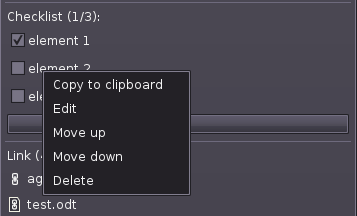 When you finish adding elements, press Esc to close the editor, or press OK to add the item and close the editor.